Not much that caught my eye in the beer world. Might pick up a four pack of the Four Winds Fresh Hopped Wild Ale. This brew uses fresh Cashmere hop, so its topical fruit flavours should only be enhanced by the use of Sacch Trois. We, as in Mrs. Left4beer and myself, are still on the quest for the perfect Pilsner. There much to enjoy in a simple, clean malt profile with a short lived complex hop snap. Sometimes you don't want a tongue piercing, enamel chipping, throat burning IPA dry-hopped with a variety designated by a number. So we had the Bad Tattoo Pils and a Northern German pils. The Bad Tattoo was solid, perhaps the malts were a little mushy, but still nice. The German number was oddly hoppy, but this might be expected for a Northern German Pils. few blocks down from KPU. I love me a good trippel. It must be hard to brew this iconic Belgian style. 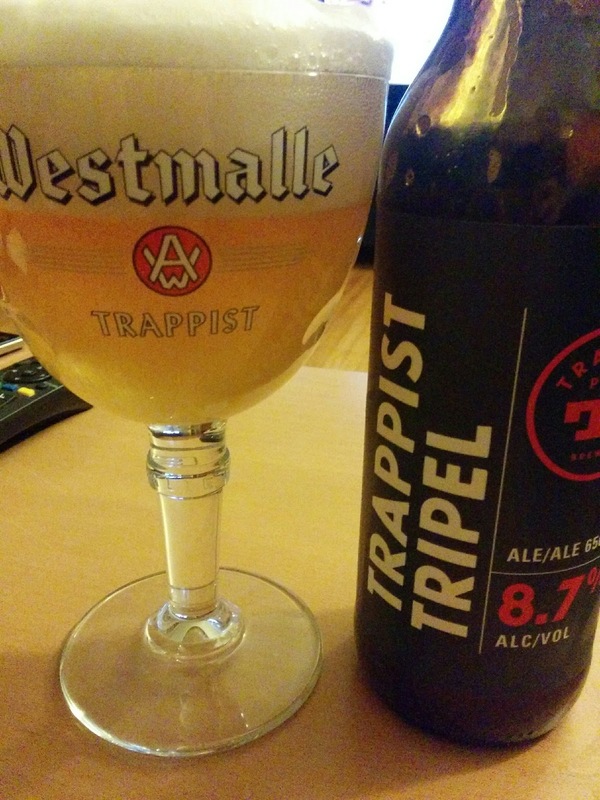 Even before the bottle is opened, drinkers wonder how it will rank up to Westmalle or La Fin. You can get a La Fin at every BCLS for about $7. Just a tip, store the La Fin for about a year. The unique, and sometimes unappealing, Unibroue yeast settles out but all the spicy flavours remain. The Trading Post came in with a very close second. After a gushing opening, the peppery, spicy hops/yeast started and finished the show. Honey and granola malts were not to be ignored, but the dry, clean finish left a definitive curtain fall. Worth the $9. This leaves the budget at $138. In case Rob was wondering, I included a $20 home brew in this deduction. So why did I stop blogging? It was certainly not due to lack of ego development. 2. Someone mentioned my posts were boring and repetitive. This person was perhaps correct. I won't name names. #$@# you Braeden. Love you, kiss kiss. 3. The last reason sounds incredibly pompous and arrogant, even for me. The enjoyment of craft beer was ruined by studying for the Master Cicerone exam. I spend almost one year studying and dissecting beers on a daily basis. I drank lots of beers. Not a lot one beer, but lots of different beers. It came to the point that the sip was not the path of enjoyment but an avenue for aroma and flavour analysis. The pop of a cork lacked enjoyment. This was only reinforced when I failed the exam. I got 68%, which was short of the required 85%. Looking back at my failing feedback, it faded the luster of the labels. Is the pinnacle of craft beer appreciation deciding if the levels of damascenone were suitable for this aged Scottish Ale? Perhaps this faded cherry flavour is not actually yeast derived but from barrel aging. Was this what beer geeks strive for; no thank you. So, I guess this blog is trying to recover my lost love of beer.